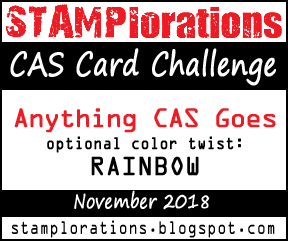 I am really excited to share todays post with you because I've created a super cool card for the November STAMPlorations CAS Card challenge. So as you can see from the graphic above this month the theme is anything goes with the added colour twist of RAINBOW. I love a rainbow card and this one is my all time best. I stamped the little monsters onto masking paper and roughly cut around the outline leaving a bigger edge than I normally would. I then stamped the monsters onto my card and added the masks over them. I used Distress Oxide inks to add the rainbow colours from top to bottom making sure to gently overlay the colours so I didn't get a harsh line where they meet. I flicked water at the card and used a paper towel to blot, this bleaches the colour leaving lighter patches behind. Once dry I stamped and embossed my sentiment in white, I love the bright white against the rainbow colours. Such fun! Love the colors!